Arthur Geisert’s latest book, Pumpkin Island (Enchanted Lion, October 2018), is set in the very place the author-illustrator calls home — Elkader, a small city in northeast Iowa. In this story, a storm arrives, sweeping a pumpkin down the river. 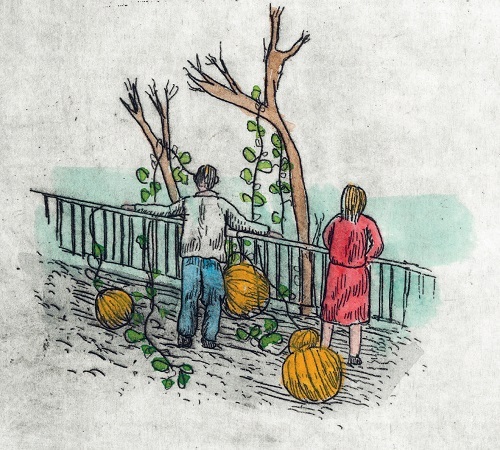 After it breaks into pieces and arrives on a small island, the seeds sprout, vines stretch, and before anyone knows it, the vines have stretched across the bridge and into town — and pumpkins begin to appear everywhere. Look at that number up there. FIVE HUNDRED WEEKS of kickin’, you all! Hard to believe, isn’t it? I think that it’s fitting that we are celebrating kicking on a day that is a sad anniversary for so many people (9/11), because the whole idea of kicking is trying your damnedest to find the light in something, even if it’s been a hard week. There are some weeks it’s even hard for me to find seven whole kicks, but I usually manage it. It’s a good little exercise, huh? So, thank you all for kickin’ with me for so long — for meeting here every Sunday to take the time to reflect (as I type every week) on Seven(ish) Exceptionally Fabulous, Beautiful, Interesting, Hilarious, or Otherwise Positive Noteworthy Things from the past week, whether book-related or not, that happened to you. (Thanks to Eisha, who founded the blog with me, for that wording.) I’m re-posting this image from Carin Bramsen. 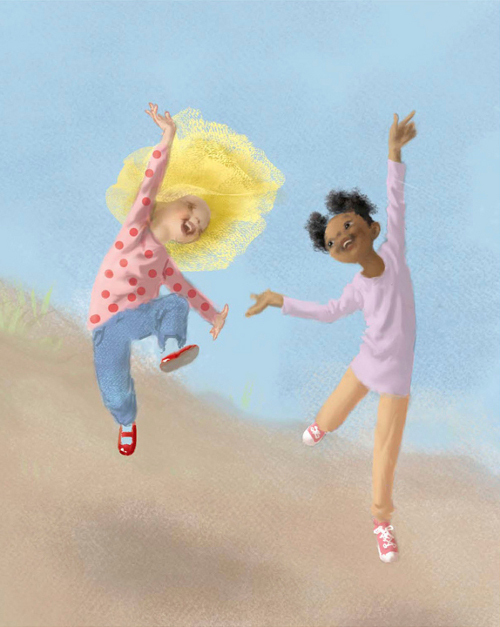 As I note on this page of my site, where I explain what 7-Imp’s 7 Kicks are, kicks kind of make you feel like the children in that image do, even if you’re not wearing a tutu on your head. 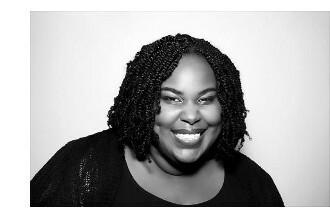 Photo of Renée taken by NAACP and used by her permission. 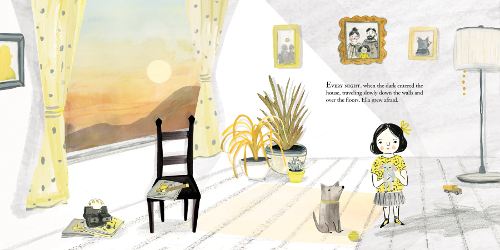 Coming to shelves next month from Groundwood is Sandra V. Feder’s The Moon Inside, illustrated by Aimée Sicuro. I like this book so much I want to show you all some spreads from it today. This is the gently-paced story of a young girl, named Ella, afraid of the dark. 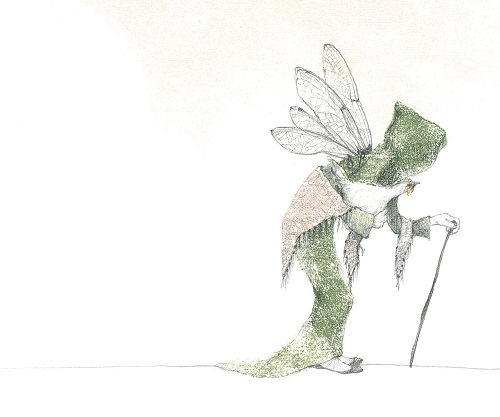 There’s no shortage of picture books on this topic, but Feder and Sicuro handle this with such care and thoughtfulness; it really stands out. Note, for one, in the spread featured above, the book’s opening spread, how evocatively and accurate Feder describes how the dark appears to a child (or, more precisely, how it moves). Ella turns on the lights in each room she enters in order “to make the dark go away.” The sun makes Ella happy, and yellow—which dominates the book’s paelette—is her favorite color. For this reason, she avoids dusk. 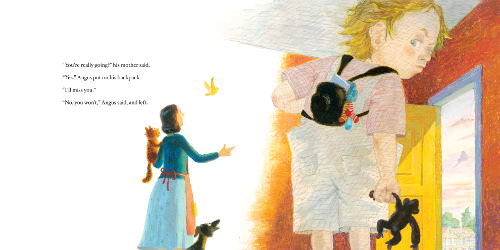 Last week, I chatted over at Kirkus (here) with Australian author-illustrator Jeannie Baker. It was fascinating to read her description of her collage-making process. 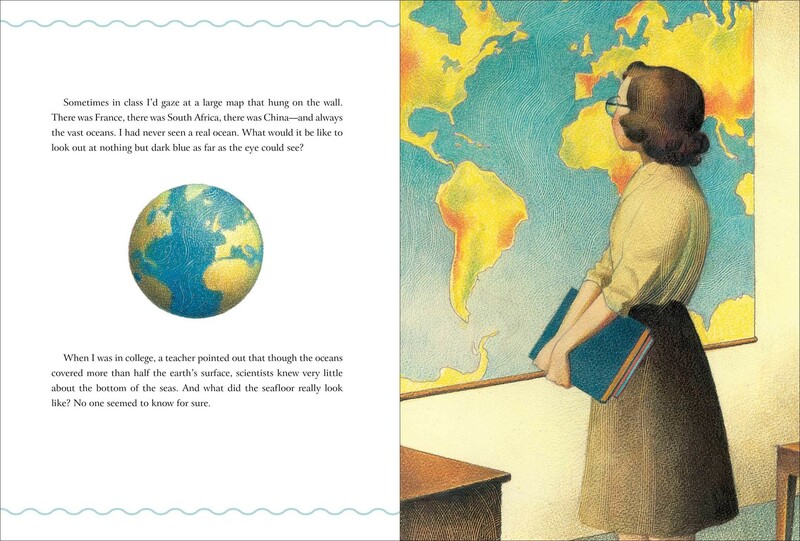 Today, I’m following up with two spreads from her newest book, Circle (Candlewick, May 2016). “‘You’re really going?’ his mother said. ‘Yes.’ Angus put on his backpack. Today over at Kirkus, I’ve got some new emerging-reader books on the mind. That link is here. I’ve got a couple of spreads here today at 7-Imp from Patrick Downes’s Come Home, Angus (Orchard/Scholastic, July 2016), illustrated by Boris Kulikov. I wrote about the book here at Kirkus last week. You can click below to see one more spread. Good morning, all. 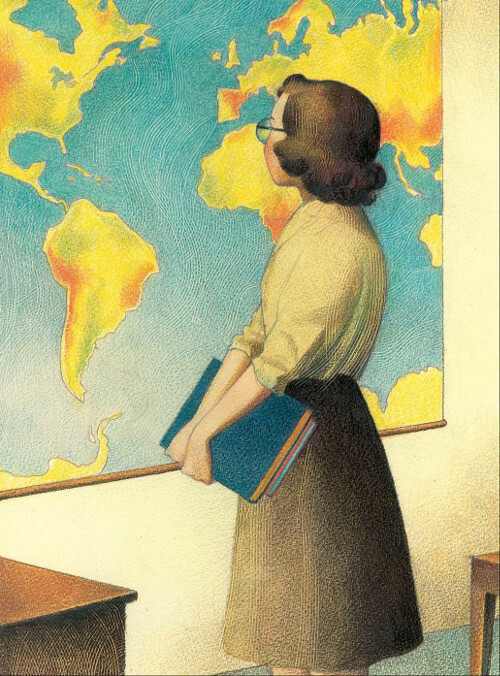 I’ve got a review here over at BookPage of Robert Burleigh’s Solving the Puzzle Under the Sea: Marie Tharp Maps the Ocean Floor (Paula Wiseman/Simon & Schuster, January 2016), illustrated by Raúl Colón. I’m following up with some art from it today. 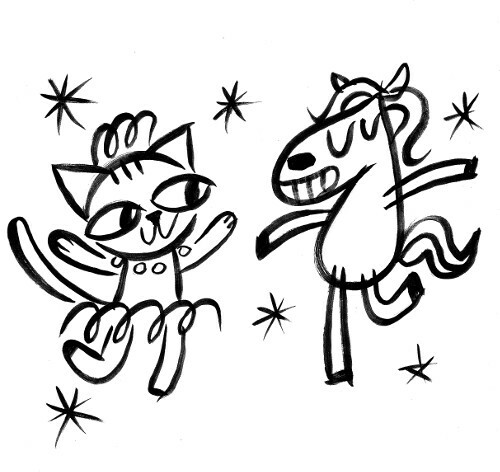 Pictured above is a sketch of the stars of Bob Shea’s new early reader series, Ballet Cat. That’s Ballet Cat herself and her best friend, Sparkle Pony. Ballet Cat: The Totally Secret Secret (Disney-Hyperion) hits shelves early next month. Shea, one of the funniest authors in the field today, captures well the dynamics of play when one friend is a bit more domineering than the other. (I relate all too well. When I was little, it was Daring Donna across the street, who’d try to get me to leap from the playground swing and grab on to the pole on the other side of the swingset.) All’s well that ends well with these two best friends, but things are tenuous for a while there while Sparkle Pony admits that he isn’t fond of ballet, the one thing that Ballet Cat enjoys the most. The text is minimal; the illustrations, uncluttered; the humor, distinctive; and the comic timing, spot-on. Shea captures expressive body language in both characters with simple and bold lines, and he plays with font size to add humor and meaning. Bob is here today to share some images from the original Ballet Cat pitch (it’s remarkable, as you can see below, how much the story was pared down for what readers hold in their hands), some early sketches, and some final art. We also talk a bit below about the very funny Dinosaur Vs. Mommy (also Disney-Hyperion), which was released last month. I’m typing this on Saturday night, and we’ve just returned from a week-long vacation to New York City. I’m pretty worn out, and since I took (most of) the week off from blogging, I’ve got no art today. 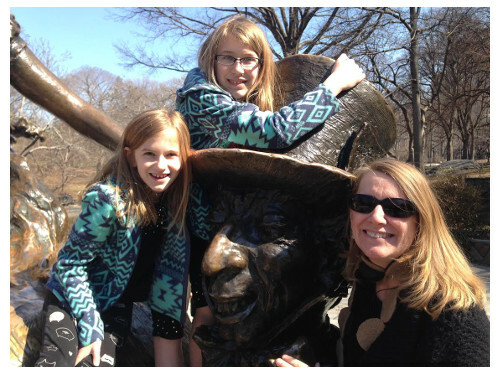 Since I can’t NOT have images, though, here’s a photo of me and my girls at the Alice statue in Central Park. I figured that was mighty fitting, given the banner at this blog, though I apologize that the Hatter’s in the shadows a bit here. So, my kicks from the week are legion: Being able to take a vacation to begin with; Central Park; Times Square; Lady Liberty (I have this weird phobia of giant iconic monuments, but she was far away enough on the ferry to not frighten me with her ginormous-ness); a Broadway show; a little girl who was sick for just one day (not a kick that she was sick, but it’s a kick that she wasn’t sick for multiple days); the graciousness of Brian Floca, Sophie Blackall, Edward Hemingway, and John Bemelmans Marciano in allowing us to visit their studio; seeing an old friend; the Met; the planetarium; the library lions; and much more. The biggest kick of all is that it was my girls’ first time to NYC. Oh, and I ended up in a segment (as in, made an utter fool of myself, but hey, why not?) on The Tonight Show with Jimmy Fallon as my family and I walked past 30 Rock. Given that I’m a huge SNL fan, it was neat to be one degree removed (or however that works) from Fallon, though my secret wish to see SNL’s Kyle Mooney on the streets, filming one of his bizarre short videos, was left unfulfilled. Oh, and I brushed past Kate McKinnon in 30 Rock. WHY DIDN’T I ASK FOR A PHOTO? Oof. Good to be home, too.